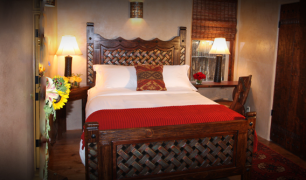 With all of the luxuries of a five-star hotel yet the privacy of a private residence, Antigua Inn is the closest bed and breakfast to the historic Plaza in downtown Santa Fe and offers the ultimate Santa Fe experience. 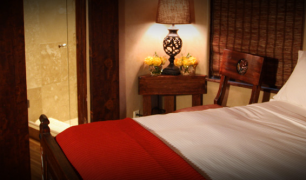 Your exclusive Santa Fe vacation is complete with dedicated concierge service, all in the center of historic Santa Fe. 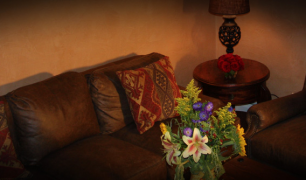 Reserve Antigua Inn as your private and luxurious vacation home in downtown Santa Fe. Each of the Inn’s five rooms have been masterfully restored to preserve the historical integrity of the Inn and to include today’s modern conveniences and comforts. Every detail has been custom-designed and incorporated so guests may unwind and be immersed into Santa Fe’s culture, art scene and dining. Antigua Inn is also the idyllic Santa Fe setting for your special event with stunningly beautiful interiors, lush-landscaped courtyards, high-tech amenities and experienced, professional staff. 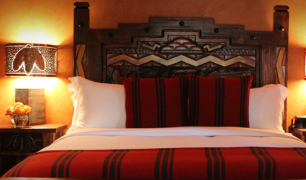 Guests will be immersed into an authentic Santa Fe experience that will be fondly remembered for years to come. Delight your guests’ culinary senses with authentic New Mexican food catered by our neighbor and local culinary legend Josie Gallegos of Casa de Comidas or from our amazing list of our approved caterers. You may also prepare a meal for your guests in our fully-equipped gourmet kitchen. The graciously appointed inn features 2,000 square feet of art-filled interior space, gourmet-kitchen, and dining room with a kiva fireplace, all surrounded by our lush-landscaped courtyards.